This is more than tangentially related to our current challenge of USDA – CDFA protocols related to management of the light brown apple moth (LBAM). As most of you know, a field of strawberries or caneberries found to be infested with LBAM by USDA-CDFA personnel is closed until it is confirmed to be cleared of the larval stages of this insect. During the time of closure, the grower is forced to sell his or her berries within the quarantine resulting in lower prices from a less robust market or absent that opportunity, leave it to rot, resulting a total loss. While the government isn't showing with a truck, getting shovels and taking the berries, it isn't difficult to define the LBAM regulatory actions amounting to government taking of the crop. The Supreme Court decision was in regards to the Raisin Administrative Committee marketing order which demanded up to 47% of the plaintiff's crop in a year. This was to support prices of raisins, but the case turned around what was fair compensation for the crop taken. The opinion of Chief Justice Roberts is telling: “The Government has a categorical duty to pay just compensation when it takes your car, just as it does when it takes your home”, in a reference to the protections afforded by the Fifth Amendment of the taking of personal property by the US government, which yes does include something like raisins. Admittedly, the broader applications of this ruling are unclear. This case concerns a marketing order rather than a regulatory regime such as that imposed by the USDA and CDFA for control of the light brown apple moth. Indeed, the Ninth Circuit court found the raisin marketing order to be constitutional since all growers benefitted from the program from the higher prices brought about by reduced supply. This could (arguably) be the case with the LBAM Program as well, since growers outside of California would benefit by not having to deal with this insect. Whatever the outcome for our situation here, it's encouraging to see the Constitution at work protecting our rights. Growers and pest control advisors on the Central Coast should be alerted to the gravity of the current leafroller situation. Owing to a warm winter, large numbers of leafrollers, including light brown apple moth (LBAM), have been observed throughout the Monterey Bay area. 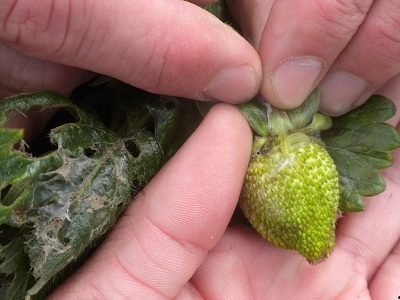 Berry growers need to be diligent in using best pest management practices for leafrollers (given in other posts on this blog as well as the UC IPM website) right now to prevent additional field shutdowns and regulatory scrutiny. The issue is particularly important for organic berry fields where worm control tactics are limited. This is a very big deal, because the USDA – CDFA regulatory effort is still in full swing. If LBAM is detected in a shipment, it could very well result in field closure for a long period of time, handing eye watering losses to the grower. Very much worth paying attention to the matter of LBAM on the Central Coast. In the way of review, growers shipping should have a compliance agreement issued to them by the County Agricultural Commissioner. Harvested fruit is inspected on a monthly basis at the cooler, and if a suspect LBAM larva is found, the shipment is held up. An investigation is launched during this time to confirm whether the larva is actually an LBAM. During this time, no fruit may be moved from the field that was the source of the lot. Results may take days to get back, and if it is confirmed to be LBAM by DNA laboratory analysis the USDA- CDFA people will visit the grower for an inspection of the block or field where the larva was found. It is very important to note that while the grower is waiting for results to get back on a suspect larva, he or she should be very active in cleaning up the field - pre-emptively treating with insecticides and removing leaf rolls. If on inspection more larvae are found in the field (they don't miss many, your threshold of detection is very low), the field is shut down for shipment outside the area of quarantine, and regulatory sprays must be done and need to be repeated until inspections find ZERO suspect LBAM larvae in the field. Regulatory sprays have to be witnessed by USDA or CDFA personnel. The whole process can take a month or longer, when one figures in delays, shortage of inspection personnel and mandated limits on work hours for state and Federal employees. Compliance agreements issued to growers require weekly inspections (every seven days) for LBAM of the production field by a PCA or qualified scout. If this weekly scouting is not done or records of it not kept, a grower having a positive LBAM find (starting 30 days to harvest for export to British Columbia, Canada) will be in violation of the compliance agreement. This will result in the compliance agreement rescinded (ie taken away) and the possibility of a hefty fine. PCA's are busy professionals, and sometimes the weather doesn't comply it might be difficult for them to get to the field every seven days. That's why it is so important for the grower to have qualified scouts on the farm doing weekly LBAM inspections (they are not difficult). Mark has held a number of trainings already, and will hold two more trainings; one in English on May 28 at 8 am at the UCCE office, 1430 Freedom Boulevard, Suite E (same office as before) and another on May 29 in Spanish at 8 am at the same location. The trainings aren't long, tops maybe an hour after which each participant will receive a signed certificate of participation. If you need help with management of leafrollers right now, you can contact Mark (mpbolda@ucanr.edu), or Hillary (hthomas@calstrawberry.org), directly to provide additional resources or to consult with you on the site specific issue, risk factors, and management options. Classic LBAM, lots of webbing on leaf to the left, larva nestled under the calyx of the fruit. The Light Brown Apple Moth (LBAM) is present in urban and natural areas of the county, and can easily migrate into agricultural fields. British Columbia, Canada has zero tolerance for LBAM in shipments of plants and harvested crops. Growers whose fruit will be shipped to British Columbia, Canada must sign a Compliance Agreement with the Agricultural Commissioner. One of the critical elements of that Compliance Agreement is visual field scouting for the LBAM. Must begin at least 30 days prior to harvesting fruit for export to British Columbia, Canada. Must be performed weekly during the harvest season. Written records of the scouting must be kept by the grower. The scouting must be done by a licensed Pest Control Advisor (PCA) OR an “approved scout”. A licensed PCA is an approved scout. Growers provide the Agricultural Commissioner with the name of their PCA, who will do the weekly scouting. The PCA may be unable to perform the required weekly scouting for the grower, due to weather, a recent pesticide application, or simply because he or she is too busy. It may be helpful for growers to assign alternate qualified “approved scouts” to ensure the scouting is performed and recorded on a weekly basis. Mark Bolda, UCCE Caneberry and Strawberry Advisor, can provide training and an “Approved Scout” certificate to those who attend the training. Mark is holding trainings in May. Canada is our county's largest trading partner. Serious consequences will result if LBAM is intercepted by Canadian officials on a shipment. The grower's records will be examined; if the grower has not complied with the terms of the Compliance Agreement, fines can be levied on the grower. The entire industry will be affected. Canada could refuse to accept harvested fruit from the County of Santa Cruz or the State of California. This would cause a drop in price received for all growers due to the extra supply of berries in the market. UCCE Farm Advisor Mark Bolda will be providing a training on light brown apple moth (LBAM) that qualifies attendees to be an “approved scout” relating to the Compliance Agreement for shipment of berries to Canada. On completion of the brief training, attendees will receive a Certificate as a record of their participation. This training will be held once in English and once in Spanish. No pre-registration necessary. All are welcome to attend, even if they do not intend to ship berries to Canada. No continuing education hours will be offered at this meeting. Please call Mark at (831) 763 8025 if you have any questions. Yes, light brown apple moth (LBAM) are being found in both conventional and organic berry fields right now, so please growers and field people be taking care to keep them out. A field closure is not pleasant for anybody involved, so do all you can to keep this pest out - pheromone based twist ties, sprays and yes even physical removal of rolls. I've included the current USDA - CDFA protocol provided to me by Laura Irons, Senior Environmental Scientist with the CDFA, for approved sprays. Note the length of time between the regulated spray of most of the materials and the time that inspectors come back - it's from 10 to even 20 days, which is a heck of a long time to be out of the market. PLEASE do all you can to keep LBAM out of your fields. I've also added the link to the USDA/CDFA LBAM inspection protocol at coolers, processors and packing facilities. It hasn't changed from the past seasons, but it's worth a review as our production year heats up.